"My daughters love Dr. Straughn. He is a great doctor. He's very professional, attentive and caring. He answers all my questions thoroughly. I would definitely recommend him. Medical Ear Piercing is now available at Forest Lane Pediatrics! The doctors at Forest Lane Pediatrics are excited to offer this service to our patients. We have selected the Blomdahl® Medical Ear Piercing System which is only available to physicians. Why should I choose medical ear piercing at Forest Lane Pediatrics? In our office your child will receive professional care from a pediatrician who has been trained in sterile technique and wound management. The Blomdahl® Medical Ear Piercing System uses single-use cassettes which minimize the chance of infection at the piercing site and medical-grade plastic piercing studs which eliminates the risk of nickel allergy. Using this system also eliminates the possibility of patient-to-patient cross-contamination because only the single-use part of the equipment ever comes in contact with the skin at the piercing site. What are the age restrictions for ear piercing at Forest Lane Pediatrics? We recommend ear piercing occur between 3 and 7 months for infants and when school-aged children are 7 years old or older. Waiting until children are 3 months old ensures that they have had their first set of vaccines and allows the ear to grow big enough to allow for accurate placing of the earring. 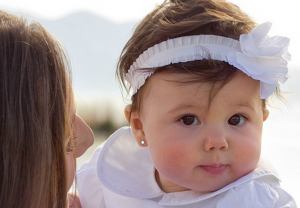 We do not recommend ear piercing for children between 7 months and 7 years of age because the child must either be small enough to allow us to completely control her movements during the procedure or cooperative enough to sit still during the procedure and be capable of actively participating in aftercare. All eligible patients must be completely up to date on all vaccines. Ear piercings are only done during visits solely dedicated to the medical ear piercing procedure. We do ear piercing by appointment only and not as an “add-on” to another sick or well visit. This allows enough time to perform the procedure, explain and answer questions about the aftercare, and allow the numbing cream to take effect. We only pierce ear lobes and only do one piercing per lobe per visit. We will perform a second, but not a third piercing, in a single earlobe. We do not pierce ear cartilage (the upper part of the ear), noses, or belly buttons. Payment covers the cost of numbing the ear prior to the procedure, piercing the ear(s), and the ear piercing studs (which you leave in for 6 weeks). Six weeks after the procedure the piercing studs should be removed and replaced with earrings of your choosing. We recommend avoiding swimming for 2-3 weeks after ear piercing. Chlorine from pools and bacteria in unchlorinated waters may irritate or contaminate the wound and delay healing. Pain: Even without numbing cream the pain is brief and similar to vaccine injection using the Blomdahl® system. Patients who are old enough to communicate verbally sometimes say that their earlobes briefly feel warm and flushed after the procedure. In order to minimize any discomfort, our price includes the use of numbing cream. We chose to use an ear piercing system that uses medical-grade plastic in order to avoid nickel exposure during the ear piercing healing process. How long do we keep the ear piercing studs in place? We recommend NOT replacing the original ear piercing studs for 6 weeks. 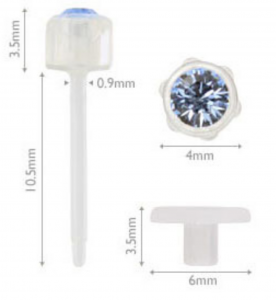 The ear piercings studs we use are thicker (1.3 mm) than the standard earring post (1.0 mm). The larger piercing hole makes it easier to switch to normal earrings after the healing period and reduces the risk of repeatedly re-injuring the ear-piercing site when replacing earrings, which should, therefore, reduce the risk of piercing site infection. Dry area well with clean gauze or a cotton tipper applicator and leave open to air. For supplementary cleansing, or when running water is unavailable, ear care solution is available at Claire’s or you may purchase Blomdahl® Ear Care cleansing swabs at our office. Leave the ear piercing studs in the ear lobe for 6 weeks before replacing with earrings. Unlike conventional ear piercings, there is no need to rotate the Blomdahl medical-grade plastic studs to prevent them from adhering to the skin. Read more about medical ear piercing aftercare on Blomdahl’s website.